3/20/15: Getting Better at This! In my last post I described feeling like I was swimming upstream as I publicly grappled with proposals before the City Council, from funding new firefighter positions to redesigning bike lanes. I value transparency, and people who watch the meeting need to know that we, your elected officials, are asking the hard questions. But admittedly that approach was not as effective as I’d hoped. What’s now clear to me is that the hard questions need to be asked in private, before the meeting, when there’s time for city staff to get additional information or research an issue more. Most of the preliminary issues and all the relevant data points need to be ironed out before the meeting so that when the five City Council members get together to find consensus, we are in the position to be able to move forward. My process is improving! I’m feeling inspired by the kids, teachers and parents in my daughter’s class at Cardiff School. We held a mock City Council meeting and they persuasively argued the topical issue of whether the city should give tickets to skateboarders who don’t wear their helmets in city skate parks. Let me give you an example. This week we heard a presentation on the Let’s Move, Encinitas! Pedestrian Travel and Safe Routes to School Plan. This is a study that the city has been working on for two years, informed by “walking audits” of our city’s 12 schools, workshops attended by more than 200 people and the gathering of more than a thousand comments from residents, among many other outreach efforts. The city spent $27,450, while a Caltrans grant of $183,000 kicked in the bulk of the funding. At the City Council meeting, many people spoke in favor of this study, particularly the parents and administrators at Paul Ecke Central Elementary School, who told us they are in desperate need of traffic improvements to keep kids safe. 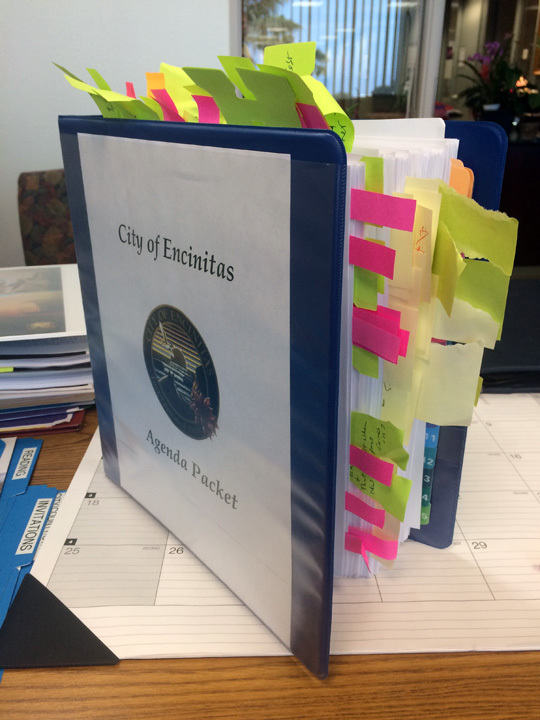 When I first read the report in the agenda packet put together by our city staff, I was unhappy with the fact that the school projects didn’t seem to be “shovel ready.” In Encinitas we have done studies related to biking, specifically the 2005 City of Encinitas Bikeway Master Plan, that have no implementation mechanism. Ten years later many of the road improvements in this plan are not getting done. This is not the fault of any one person or the result of ill intentions. Sometimes there has to be a structural or institutional change in order to see a different outcome. It’s easy to chock up the problem to a lack of funding, but I think our approach could improve. In the Bikeway plan, there isn’t a clear triggering mechanism to ensure that the plan is consulted at the inception of a project that impacts bikeways. It sometimes seems like bicycle and pedestrian improvements get built after advocacy by outside groups, not as part of a proactive, multi-modal approach to our streets. I want this Safe Routes to School plan to result in actual improvements, even if they are incremental. A crosswalk and a little red paint can make a big difference. At a bare minimum, I think kids who live within five blocks of school should be able to walk safely to school, and not have to be driven by parents who fear for their safety. We’ve gathered some great data at every school, now let’s make sure we use that data every time we re-slurry or improve our streets. After several back-and-forth discussions with the engineering department, reviewing other documents and the grant application itself, I finally felt comfortable with the reality that completion of this Safe Routes to School “plan” doesn’t mean that each school will have a specific and mapped out “plan.” The goal was to “assess existing conditions” and “conceptualize enhancements.” This means that engineering staff will need to take the large amount of data and get back to us with an actual plan, i.e. where specifically the sidewalks, crosswalks, flashing signs, traffic calming, red curb, will be at each school. The specificity isn’t nailed down yet, which means the hard choices still have to be made — in terms of design (and subsequently in terms of funding). I’m diligently working to understand what we could do to institutionalize bicycle and pedestrian planning or how to more proactively create “complete streets.” Before my time, the City Council prioritized these “complete streets,” which account for drivers, bikers and walkers when projects are designed. It’s not clear to me exactly what the implementation mechanism should be to make this happen as a matter of routine, but I believe we as a city could do better in this area, and I’m committed to working on it alongside my colleagues. There are a multitude of topics in any given week, and serving on the City Council requires making choices about my time. I care very much about our city’s transportation and our built environment, and have chosen to prioritize that. At the end of this week’s meeting, I requested that staff bring back information on what types of historic designations are available for La Paloma Theatre, built in 1928. I’d like to make sure we do what we can to preserve this historic landmark. If you haven’t heard, Council Member Tony Kranz floated a fun idea about temporarily re-naming Vulcan Avenue in front of City Hall “Spock Block” next week to honor the late Leonard Nimoy and his Mr. Spock Star Trek character. It was approved unanimously!